Reference number for this case: 3-oct-54-Bergerac. Thank you for including this reference number in any correspondence with me regarding this case. All France speaks about it! From the Saintonge to the Normandy, from the marches of the East to the sweet Provence, "saucers", "cigars" and other mysterious flying machines took possession of the sky of our country. Is it a strange psychosis propagated in the manner of a striking epidemic which makes the majority of the witnesses "see" the observed phenomena - they are now thousands - imaginary machines while others are the credulous toys of shameless mystifiers? Here the film of the night of October 1. There, in the Louis-Belin street, in Bergerac, a mysterious machine appeared to MM. Defiz and Labonne. From left to right and from top to bottom, the attitudes of those who lived these moments. 1. On bicycle, Mr. Defiz returns from work: 10 P.M, , a gleam is visible in the sky. 2. It descends, taking the shape of a rocket. 3. It lands in Mr. Labonne's garden (marked with an arrow). 4. The machine lands on a strip of land, 3 meters out of 5 meters, (indicated by a circle). 5. In the morning, in edge of this piece of ground, mushrooms have grown. 6. Mr. Labonne, who is now in company of Mr. Defiz, has not recovered yet of his emotion. 7. As for Mr. Defiz, he remakes a drawing representing the silhouette of the machine. 8. Mr. Boyer and Mr. Marat, first of all skeptics, do not doubt the declarations of the two men anymore. ing on the railway. Two hours before this appearance, in the hamlet of Mauriéras [Sic, Mouriéras], community of Bugeat (the Corrèze), Mr. Mauzaud stated on his side to have been kissed by the space man. It is still on a railway that this time close to Bergerac, a witness claims to have seen a mysterious "flying machine" on the ground. Indeed, on October 1st, at aoubt 10 P.M., Mr. Jean Defiz, aged 26, living on 28, street Louis-Belin, in Bergerac, assembler in central heating, regains his residence. On his bicycle, by a narrow dirt track which skirts the railway which goes from Bergerac to Agen. The night is black, thick, without a light at the horizon. And suddenly, just above his head, at high altitude, an intense gleam goes down at a vertiginous speed towards the ground. At the time, now specifies Mr. Defiz, I believed that it was a shooting star, however an inordinately large one. I then observed more attentively and I noticed a machine having the shape of a rocket. On three occasions it was coloured of a greenish colour. I was wrong, recognizes Mr. Defiz, not to have stopped to follow more of its evolutions. Getting off his bicycle, he then quickly crosses his garden and goes up to his room located on the first floor of the house of Mr. Marius Marot, of which he is the tenant. Still impressed by this luminous vision, he spontaneously goes towards the window, leans to attract the shutters towards him, and again, this time like outgoing from the ground, the machine still appears more fluorescent to him than previously. In same time an air drainage is formed, surrounds him and seems like wanting to grab him. Amazed, his eyes fixing the machine, he sees under the half-spherical black cupola, three crutches which fold up slowly, while the apparatus rises more quickly in a whistle of air, always more quickly. And again there is the luminous trail which is lost at the end of a few seconds in the clouds. Mr. Defiz fearing the sarcastic remarks and the mockeries did not tell around his adventure. Only at the following day at breakfast, before going to work, he evoked his vision for his owner Mr. Marot. The latter did not think at this point, that he was going to be a few hours later the witness of an almost identical and even more upsetting confidence. Mr. Marot works with the tobacco warehouse of Bergerac. In the morning of October 2, one of his companions, Mr. Jean Labonne, aged 63, retired from S.N.C.F. [state railway company], domiciled not far from Mr. Marot, at 18, street Louis-Belin, take hims as confidant. - It was 22 hours approximately. I was at home alone, and returned to close my gate when, arriving at the entry of my garden which extends behind the house up to the railway, I saw, posed on a strip of land of 3 meters by 5 meters, a machine having the shape of a mushroom. If the cap were of sunk colour, the body builds apparently out of plexiglass, it was luminous. And then there in front of me, within 3 meters hardly, appearing like forbidding to me the alley of my garden, a shade. "Who is there? I shouted. Who are you? What do you want from me?" I did not dare to take a step. "At the sound of my voice, the black shape made a complete turn, slipped to the machine, and, in a few seconds, it rose towards the sky followed by a trail of light. I very clearly saw three crutches which folded up, under the cupola." "But my astonishment therefore was not finished. At dawn, I woke up and returned in my garden close to the place where I had seen the apparatus. On the rich ground, I discovered three light prints; but what upset me more, is a flowering of black colour mushroms with long stems, unknown in the area, which had suddenly grown. I did not dare to touch, and besides, they dissipated like dew with the first rays of the sun." Is it necessary to specify that this declaration of Mr. Labonne, who had as witness, after Mr. Marot, Mr. Leonce Boyer, foreman of the tobacco warehouse, and the workmen Mitsers Denis Rivière and Emile Marty, caused hilarity. These laughters, as involuntary as they were, caused the immediate silence of Mr. Labonne who refused thereafter to renew his account. He was to speak about it only Monday October 4, during the morning with his neighbor Mr. Defiz whom Mr. Marot had informed of the vision of Mr. Labonne. Testimonys of these two men make it possible to locate exactly the operation of this machine. It is, without doubt, Mr. Defiz who had to see it first whereas the apparatus was on the point of landing in the garden of Mr. Labonne. During the few minutes which passed until Mr. Defiz gained its room, the machine appeared to Mr. Labonne. Then was the takeoff and the vertical ascencion, which caused this airflow that Mr. Defiz felt. Currently, the companions of Mr. Labonne reconsidered their first impression. If it were indeed logical that the first declaration of M. Labonne made one smile, the serious character, the frankness, the balance of this man cast doubts in the minds. Mr. Boyer in particular, his chief, does not hide that his scepticism starts to be seriously shaken. "A man like Mr. Labonne, whom I know since many years, cannot indulge in such pranks. It is not in his character." Besides, it is enough to see Mr. Labonne, to detect his trouble, the concern which still invades his glances, to understand that he by no means makes a point of wanting to make admit a tale worthy of the apocalypse. He does not dare to touch again with his finger this ground where he saw the machine landing. One feels he is the victim of a violent fear, which appears to intensify more each day. As for Mr. Defiz, he is a young boy of sporting allure, with honest looks, direct, who speaks without hesitation, with precision and clarity. "I served in the aviation, he says. I know what a jet airplane is, what a weather balloon or even a radio-controlled rocket are. But in the present case there cannot be any mistake. Flying saucer, flying cigar, whether they come from Mars or elsewhere, it does not matter. That of which I am positive, is that the machine was of a strange shape and that never in my life I had not had the occasion to see something similar." In Bergerac, mysterious mushrooms push and disappear between the "feet" of a saucer! Two witnesses fearing to have been victims of a simultaneous hallucination, had not dared to speak earlier about the strange vision than they had on Friday evening, October 1, at 10 p.m..
Mr Jean Dufix, fireman in Bergerac, returned at his place, when, looking up, he saw an extraordinary gleam in the sky. Returned at his place, he had the impression of a general flashover in the garden, he saw a machine rising from the ground: it had the shape of a disc, is said to have become luminous and it left at a vertiginous speed. The next morning at a very early hour, Mr Dufix went to get his immediate neighbor Mr Jean Labonne, aged 61, pensioner, whom he asked whether he had not seen anything of extraordinary in his garden. After many hesitations, because he was afraid that people laugh at him, Mr Labonne, still under shock, totally confirmed the strange vision of Mr Dufix. It was while going to close the door of his garden, at approximately 10 p.m., that he was suddenly frozen on the location by a mysterious shapre and that he saw between a peach tree and his arbour, in a not sown piece of ground, a luminous disc of approximately three meters of span, which seemed to rest on three crutches. Almost immediately, the machine took off from the ground and disappeared at a high speed. The two men went to the site indicated by Mr Labonne and saw, on the ground, some vague traces near which came to grow a score of mushrooms of an unknown species. These mushrooms are said to have disappeared with the first gleams from the sun. On October 1, Mr. Jean Defiz, 26 years old, assembler in central heating in Bergerac, was going back home around 11 p.m.. Black night, thick, without a light at the horizon. Suddenly, just above his head, at high altitude, an intense light goes down at a vertiginous speed towards the ground. It is not a shooting star, ensures Mr. Defiz, but a craft having the shape of a rocket which is coloured with three resumptions of a greenish colour. The eyes rivetted on the apparatus, Mr. Defiz sees under the half-spherical black cupola three crutches which slowly folded up while the apparatus, in a whistle of air, reaches height again and is soon lost in the clouds. That is not bad already, but there is better. The following day, a neighbor retired of S.N.C.F. [national railway co], Mr. Jean Labonne, 63 years old, discovers in his garden, at 10 p.m., a luminous craft having the shape of a mushroom and built out of plexiglass (sic). "Suddenly, in front of me, within three meters hardly, appearing to block the alley of my garden to me, a shadow. "Who is there? I shouted. Who are you? What do you want from me? I did not dare to take a step. At the sound of my voice, the black form made a half-turn, slipped to the machine and, in a few seconds, the craft rose towards the sky followed by a trail of light. I very clearly saw, under the cupola, three crutches which folded up. At dawn, I returned in my garden, close to the place where I had seen the craft. On the fatty ground, I discovered three light prints; but what upset me more, was unknown mushrooms, long of stem, of black colour, flowering in the area, which had suddenly grown. I did not dare to touch and besides they dissipated like dew with the first rays of the sun." I remember that during a session at the House, around 1906, the unfortunate Rene Viviani (dead insane) declared in a beautiful manner (1) : "We have extinguished in the sky lights which shall not be relight". Viviani was wrong: something is re-ignited in the sky, but oh derision, they are... flying saucers! Please don't tell me that in Bergerac like elsewhere where people of perfect good faith believe to have seen something in the sky, do not tell me, that these are simple phenomena of hallucination. The "thing" undoubtedly does not exist per se: it exists for the visionaries who need to believe in the fantastic. Because, come on, what does one offer to Mr. Defiz or Labonne? A materialist civilization where the top of the top consists in having a car (myth of the mechanical power), or a fridge, or a television set (myths of the false comfort and false culture). Very sorry, but that has nothing to do with the true civilization which, on the contrary, is founded on individual poverty and renouncement. The only great highly civilized eras, I'm not telling anything new here, were thes Magdaledian, Egyptian, Greek and medieval eras. Why? Because men of these times, animated of a profound faith, had powerful reasons to hope. Very well, but satiety comes quickly from what one owns and which one can inventory, but the spirit remains dissatisfied. This is why, in the absence of true miracles in a faithless century, we see the flying saucers thriving, the "Christ of Montfavet" , innumerable small churches ejusdem farinae , while waiting for a new blaze of catharism . René Raphaël Viviani (1863 - 1925), French Republican politician, president of the Council before WWI. He declares in 1904 "we extinguished in the sky lights that shall not be relight anymore" when an order of the Minister for Law and Order requires that the crucifixes and other religious symbols be withdrawn from schools. Motorocyle of Italian manufacture which was a huge commercial success. "Ejusdem farinae", Latin expression, literally "of the same flour", meaning, "same stuff." George Roux announces in 1947 that he is the reincarnation of Christ and creates the "Universal Christian Church", classified as sect still today by the French Parliament. Roux pronounces that "medicine is useless", that you can miraculously cure any disease by laying hands on it if you are in "harmony with one's conscience and the universe." In 1953 and 1954, several children of his followers died, Roux regarded them as "rewards offered to Christ". Roux would be much discussed in 1954, due to the lawsuit for nonassistance against him. Many journalists insinuate in articles ridiculing the flying saucers that people who see saucers are as dubious than the "Christ of Montfavet". Nowadays still, journalists sometimes equate ufologists to dangerous sect gurus or the witnesses to sect members. Very important neo-gnostic movement coming from Bulgaria towards the south-west of France in particular. Cathares deny the Trinity, think that the material visible world emanates from bad god and aspire to a higher world where the real divine reigns which they try to reach by givin up material goods, by individual moral purity. They were sorry at the materialism and the enrichment of the Catholic clergy, which, without succeeding in defining their doctrines exactly, had them all killed for heresy. The author of the article shows in several points that he admires the cathare heritage. This Venusian measured about 1 m 73, he short brown hair, and his skin seemed tanned. He was completely wrapped in a kind of combination which had the appearance of a armored coat. In his nose were two small tubes joined by a metallic wire... Mr. Allingham managed to touch the saucer whose metal was slightly warm, and he finally took the leave of Venusian, not without having offered him his pen, which the man carefully put in a pocket of his combination and after having taken on the run a photograph of the strange character. This rather fuzzy image is, it should be acknowledged, rather unrevealing. One sees the silhouette of a man seen from the back, walking slightly curved, and that, without a little imagination, could easily be matched with the silhouette of any earthman. Jimmy Guieu indicates that on October 6, 1954 a UFO landed in Bergerac, observed by two men. The craft was a kind of luminous greenish spindle which rested on three crutches. It remained little time on the ground and took off vertically. A violent air drainage followed which brutally whipped the witnesses. Weird traces resembling blackish mushrooms remained during a few minutes then slowly disappeared on the surface of the ground. Aimé Michel seems to place the case at October 3, 1954, adding that it could not obtain the exact hour of the observation. He evokes that the observed phenomenon was "a circular machine three meters in diameter" which landed in the garden of Mr. Jean Labonne who saw it flying away, while a "fireman of the city, Mr. Jean Defix, was also a witness." Michel Carrouges indicates that in the Labonne observation the saucer landed in the court or the garden where the witness was. Oct. 01, 1954, 10:00 P.M., Bergerac (France). The author indicates that on October 1, 1954, whereas he was returning at his place in the night, a fireman of Bergerac saw an oval light in the sky, then lost sight of it. But later he had a moment of fear: his courtyard seemed on fire. He run outside and saw a disc leaving the ground with a whistle. The object flew away up to moderated height, then became luminous and rose at "a dazing speed". Early on the next day, he asked his neighbor, a pensioner, if he had not observed something unusual. The neighbor, reluctantly, admitted that whereas he was closing the door of his garden, he had suddenly been paralyzed and had observed a disc of approximately 3 meters in diameter posed on three legs in the courtayrd. Almost immediately, it had flown away with a draught and he had lost sight of it. Jacques Vallée indicates that on October 1, 1954, at 10:00 p.m., in Bergerac, the Dordogne, returning home, fireman Jean Dufix, 26, saw an oval light in the sky and thought it was a shooting star. Later he was alarmed when his yard seemed to be ablaze. Rushing out again, he saw a disk rise from the ground with a whistling sound. It flew off, became luminous again, and took off at fantastic speed. A neighbor, Jean Labonne, 61, saw the disk, 3 m in diameter, resting on three legs in the yard. Barthel and Brucker wrote that the case was a hoax. They rename Jean Defiz "Jean Dufix" and claim there was "never any mushrooms" in Bergerac because there was no saucer, but they do not substantiate the claim of a hoax whatsoever. "In the heading: saucers, cigars and cylinders. In Bergerac, mysterious mushrooms grow and disappear between the 'feet' of a saucer! Two witnesses fearing to have been victims of a simultaneous hallucination, had not dared to speak earlier about the strange vision than they had Friday evening 1st of October, at 10 p.m.. Mr Jean Dufix, fireman in Bergerac, returned home, when, while looking up, ge saw an extraordinary gleam in the sky. Returned home, he had the impression of a general flashover in the garden, he saw an apparatus rising off the ground; the latter having the shape of a disc, is said to have become luminous and left at a vertiginous speed. The nest day morning very early, Mr Dufix went to find his immediate neighbor Mr Jean Labonne, aged 61, pensioner, and asked him whether he saw anything extraordinary in his garden. After many hesitations, as he was afraid to be scoffed at, Mr Labonne, still shaken, point by point confirmed the strange vision of Mr Dufix. It is while going to close his garden's door, at about 10 p.m., that he was suddenly nailed on the spot by a mysterious shape and he saw between a peach tree and its arbour, in an unsown part, a luminous disc of approximately three meters of wingspan, which seemed to rest on three crutches. Almost immediately, the machine took off the ground and disappeared at a high speed. The two men went to the site indicated by Mr Labonne and saw on the ground, some vague traces close from which came to grow a score of mushrooms of an unknown species. These mushrooms are said to have disappeared at the first gleams of the sun." The two ufologists indicate that on October 3, 1954 at 10 p.m. in Bergerac, Jean Defix, aged 26, fireman, returns home and sees an oval light in the sky and thinks that it is a shooting star. Later, he is frightened when he sees its yard set ablaze. He rushes outside again and sees a disc rising ground with a whistling sound. It goes up, becomes luminous and disappears at a fantastic speed. A neighbor, Jean Labonne, aged 61, saw the disc resting on three feet in the yard. The authors indicate that the sources are the Vallée catalogue, case 176; Quincy; C. Garreau and R. Lavier in "Face aux ET" page 74; Aimé Michel in "A propos des S.V." page 164. They note that Garreau tells that the craft took off in total silence, that Jacques Vallée dates the case at October 1st, that Michel, Quincy and Garreau give the date of the 3rd. The "shooting star" that landed. It was getting late (10:00) the evening of October 1st as French fireman Jean Dufix returned to his home in Bergerac. A streak of light lit up the heavens and M. Dufix thought for a moment he was witnessing a shooting star, but this object was close, too close, in fact it appeared the "meteor" had impacted in his own backyard since a red glow illuminated the area. As a fireman M. Dufix's immediate impression was that his property was ablaze. A neighbor, M. Jean Lebonne [sic], evidently attracted by all the light, peered out a window and saw a strange, disc-shaped, object about three meters in diameter, "parked" in M. Dufix1 s yard. The thing was motionless, resting on three legs. M." Dufix quickly arrived, on the scene and saw for himself the mysterious object. The UFO did not stay long. It soon rose, became luminous again (it had apparently lost its glowing appearance when it touched down) and shot away at a fabulous velocity. 9. Paris, France. Le Figaro. 6 October 54. A ten foot wide luminous disc was reported on the ground by two people near Bergerac. The object had three "legs," or what one might call landing supports. No figures were noted in the vicinity. 50. Jean Sider wrote a precise chronology of the case, based on the Nouvelle République newspaper, much more correct than the others. Also and noteably, he provides the newspaper account in the newspaper La Nouvelle République, which others seem to have missed. Jean Sider notes that Barthel and Brucker never talked on the phone to the witness Jean Defiz, contrarily to what they wrote. Ufologist and author Jean Sider wrote on the case of October 1, 1954, at 10:00 p.m., in Bergerac, the Dordogne. He indicates that the witnesses are Jean Labonne, 63 years old, 18 rue Louis Belin, and Jean Defix, 26 years old, 28 rue Louis Belin, in Bergerac. He indicates that returning home by bicycle, Mr. Defix was almost arrived when he suddenly saw a green gleam in the sky which went down towards the ground at a vertiginous pace. It was a machine in the shape of a rocket; which landed in Mr. Labonne's garden, not far from the house of Mr. Marot where Mr. Defix resided. Mr. Defix decided to see what it was about by going up on the 2nd floor of his home from where the sight was better. Meanwhile, Mr. Labonne came outside his place in order to closing his gate and he saw the machine posed on the ground. He foresaw a black shape three meters of it. He shouted: "Who are you? What do you want from me? ", but the intruder did not answer and regained his machine which took off immediately. At this precise time, Mr. Defix, who had just opened the shutters of his room on the 2nd floor, saw the apparatus rising, like fluorescent, while a whistling sound was heard and that an air blow was formed, surrounding him, as if it wanted to grab him. He had time to notice that under the hemispherical black cupola were three crutches which folded up slowly, then in a few seconds, the apparatus was lost in the clouds after having left a luminous trail. At dawn, Mr. Labonne stood up to go to see whether traces of the event remained on the landing site. He noted three slight prints on the fatty ground of his garden, and a great number of mushrooms of black colour and long stems, unknown in the area, growing on the landing site. He did not dare to touch them, and besides, they dissipated like dew at the first gleams of the sun. Mr. Labonne told his story to Mr. Marot, owner of Mr. Defix, to Léonce Boyer, Denis Rivière and Emile Marty; which started general hilarity and muted the ulcerated witness. But on October 4, Mr. Defix met Mr. Labonne because his owner Mr. Marot had told him of the events, and when the scoffers were informed of the experiencet lived by Mr. Defix, they changed opinion quickly. 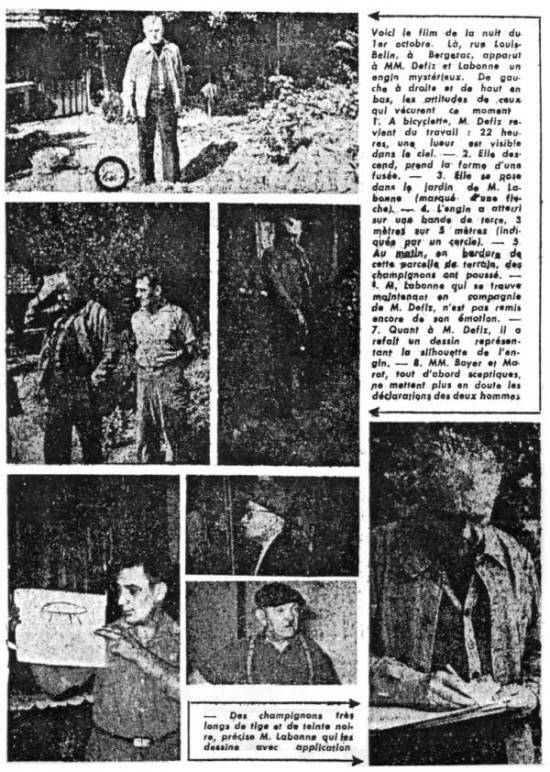 Jean Sider indicates that this comes from an investigation by Mr. André Euloge, special correspondent, published in the newspaper La Nouvelle République, of Bordeaux, for October 6, 1954, p. 1, 3, and 4. He notes that it is the only source telling of a CE3, and that the case is remarkable for the landing and the takeoff of the UFO were observed by two witnesses one without the knowledge of the other. He adds that Barthel and Brucker, who never met Mr. Defix nor spoke to him on the telephone as opposed to what they claim, thus rejected a very important case without even knowing all the details it had. Godelieve van Overmeire indicates that on October 1, or 3, 1954, in France, in Bergerac, in the Dordogne, at "10 p.m.. Returning home, a fireman, Jean Dufix (aged 26), saw an oval light in the sky and thought that it was a shooting star. Later, he was frightened when he saw the yard of his home entirely set ablaze. Rushing outside again, he saw a disc which rose from the ground with a whislting sound. It went up, became luminous again and disappeared at a vertiginous speed. A neighbor, Jean Labonne (aged 61), had seen the disc, 3 meters in diameter, resting on 3 feet in the yard". 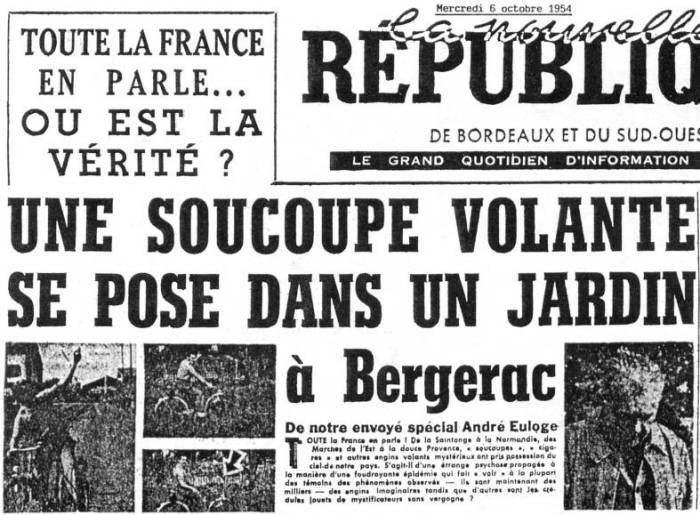 The sources are indicated as "Le Figaro, Oct. 6, 1954; France-Soir, Oct 7 and 8, 1954; "Historia" special issue #46 in 1976: Les soucoupes volantes, p. 42, extr. from: Jacques Vallée: "Chronique des apparitions ET" - DENOEL 1972 - J'AI LU COLL. - p. 264 who gives the date of 10/1/54; Michel, Quincy and Garreau give the date 10-3-84." On Oct. 1, 1954, In Bergerac, France. Returning home, fireman Jean Dufix, 26, saw an oval light in the sky and thought it was a shooting star. Later he was alarmed when his yard seemed to be ablaze. Rushing out again, he saw a disk rise from the ground with a whistling sound. It flew off, became luminous again, and took off at fantastic speed. A neighbor, Jean Labonne, 61, saw the disk, 3 m in diameter, resting on three legs in the yard. The Australian ufologist indicates that on 1 October 1954, in Bergerac, France, "a man was closing a gate when he was paralysed. He saw a disk, of some 3m diameter, resting on three legs, on the ground. It took off." The source is indicated as "Bowen, C. 1969. The Humanoids. Neville Spearman. London. p34". 1954 - Returning home from work in Bergerac, France fireman Jean Dufix, age 26, saw an oval light in the sky at 10 o'clock. He first took it to be a shooting star, but later he was alarmed when his yard looked to be ablaze. Rushing outside, he saw a disc rise from the ground with a whistling sound. It flew off, became luminous again, and then shot off at a fantastic speed. His neighbor, Jean Labonne, age 61, also saw the disc resting on three legs in the yard. They estimated the disc was three meters (10 feet) in diameter. (Sources: Le Figaro, October 6, 1954; Jacques Vallee, Passport to Magonia: A Century of Landings, p. 214). Jerome Beau indicates that on Friday October 1, 1954, at 22 hours "in Bergerac (France), Jean Dufix" "26 year-old, fireman", "returns home when he sees 1 oval light in the sky which he takes for a shooting star, and he loses his sight. Later, he has a moment of fear: the yard of his house seems set ablaze. He rushes outside and sees 1 disc rising from ground with a whistling sound. The object flies away up to a moderated height, then becomes again luminous and leaves at a dazing speed. Early the next day, he would ask hi neighbor" "Jean Labonne, 61 year-old, retired" "whether he did not make an unusual observation. The latter, with reserve, admits that whereas he closed again the door of his garden, he was suddenly paralysed and saw a disc approximately 3 m in diameter, posed on 3 feet in the yard. Almost immediately, it flew away with a draught and he lost sight of it." The sources are indicated as "Le Figaro, 6 October 1954"; "France-Soir, 7 and 8 October 1954"; "Vallée, J., case #38, 'Rapport sur l'analyse de 200 observations documentées faites en 1954'". Luc Chastan indicates that in the Dordogne in Bergerac on October 1, 1954, at 22:00 hours, the first testimony is: "The first witness, 26 year-old, assembler in central heating, goes back home. By bicycle, by a narrow dirt track he skirts the railway which goes from Bergerac to Agen. The night is black, thick, without a light at the horizon. And suddenly, just above his head, at high altitude, going down at a tremendous speed towards the ground an intense gleam. At the time he specifies, I believed that it was about an inordinately large shooting star however. I then observed more attentively and I noticed a craft in the shape of a rocket. Three times it was coloured of a greenish colour. The witness stops to better follow the maneuvers of the object. Puttind down his bicycle, he then quickly crosses his garden and goes up to his room located on the first floor of the house. Still impressed by this luminous vision, he automatically goes towards the window, leans to grab the shutters towards him, and again, this time on the ground, the craft appears still more fluorescent to him than previously. In the same time an air drainage is formed, the environment seems like it wanted to grab him. Amazed, his eyes focused on the craft, he sees under the half-spherical black cupola, three crutches which are folded up slowly, while the apparatus rises in a whistle of air more quickly, always more quickly. And there is still a luminous trail which is lost at the end of a few seconds in the clouds." The second testimony is: "The second witness, 63 year-old, retired S.N.C.F. [national railway co.], domiciled not far from there, tells: - It was 22 hours approximately. I was alone at home, and went out to close my gate when, arrived at the entry of my garden which extends behind the house until the railway, I saw, posed on a strip of land of 3 meters out of 5 meters a craft having the shape of a mushroom. Whereas the cap was of sunk colour, the body builds apparently out of plexiglass, it was luminous. And then there in front of me, at 3 meters hardly, appearing like if it forbad the alley of my garden to me, a shade. Who is there? I shouted. Who are you? That do you want from me?" I did not dare to take a step. At the sound of my voice, the black form made a half-turn, slipped to the machine, and, in a few seconds, the latter rose towards the sky followed of a trail of light. I saw very clearly, under the cupola, three crutches which were folded up. But my astonishment was not finished. At dawn, I stood up and returned in my garden close to the place where I had seen the apparatus. On the fatty ground, I discovered three light prints; But what upset me more, was that black coloured, longstemmed and unknown mushroom flowered the area, which had suddenly grown. I did not dare to touch, and besides, they were dissipated like dew at the first rays of the sun." The website indicates that on 1 October 1954 at 22:00, in Bergerac, France, "returning home from work in Bergerac, France fireman Jean Dufix, age 26, saw an oval light in the sky at 10 o'clock. He first took it to be a shooting star, but later he was alarmed when his yard looked to be ablaze. Rushing outside, he saw a disc rise from the ground with a whistling sound. It flew off, became luminous again, and then shot off at a fantastic speed. His neighbor, Jean Labonne, age 61, also saw the disc resting on three legs in the yard. They estimated the disc was three meters (10 feet) in diameter." "Returning home, fireman Jean Dufix, 26, saw an oval light in the sky and thought it was a shooting star. Later he was alarmed when his yard seemed to be ablaze. Rushing out again, he saw a disk rise from the ground with a whistling sound. It flew off, became luminous again, and took off at fantastic speed. A neighbor, Jean Labonne, 61, saw the disk, three meters in diameter, resting on three legs in the yard." "An object was sighted that had an appearance and performance beyond the capability of known earthly aircraft. One saucer, about 10 feet across, was observed by two male witnesses on a farm." The sources are indicated as Bowen, Charles, The Humanoids: FSR Special Edition No. 1, FSR, London, 1966; Vallee, Jacques, Computerized Catalog (N = 3073); Vallee, Jacques, A Century of Landings (N = 923), (in JVallee04), Chicago, 1969; Hatch, Larry, *U* computer database, Author, Redwood City, 2002. Fireman Jean Deafix was cycling to his apartment in Rue Berlin, along the track by the railway line, when he saw an intense light, which resolved itself into a fusiform object emitting three green flashes, descending at dizzying speed. He got home and was about to close the shutters when he observed the object again, emitting an intense light, much closer, apparently taking off from the ground. As he watched he saw a tripod landing gear retract on the underside of the hemispherical object. As this object took off it left a vacuum into which air rushed, almost pulling him forward. There was a whistling sound and the object took off into the clouds. Next day he told his landlord, Marius Marot, with whom he lived, about the incident. Later that day Mr Marot’s neighbour, retired railwayman Jean Labonne, told Marot that at the same time as Deafix’s experience, he Labonne had gone to close the garden gate to the railway, when he caught sight of a mushroom shaped object on a piece of ground, 3m by 5m. The upper part was dark; the body of the object resembled Plexiglas and was luminous. Then, no more than 3m away, a shadowy figure stood up blocking Labonne’s path. He yelled out to the stranger, asking him who he was and what he wanted. The figure did not reply but turned around and walked back to the object, which took off seconds later leaving a luminous trail. Labonne saw the three landing legs being retracted. After a sleepless night Labonne went to investigate the site at dawn, where he found three slight impressions, and that strange, black, long-stemmed mushrooms had grown up overnight. He did not dare touch them and they volatised at the first rays of the sun. Alain Gamard, citing J. Giraud, citing Rene Sampson and local press. Vallee case 176, citing Figaro 6 October 1954 + France Soir 7 and 8 October 1954. The author indicates that there was a close encounter of the 3rd kind in Bergerac, in the Dordogne, on October 1, 1954, at 10:00 p.m..
Jean Defix, 26, returned home on a bicycle and had almost arrived when suddenly he saw a green gleam in the sky which went down towards the ground at a vertiginous pace. It was a craft in the shape of a rocket which landed in Mr. Labonne's garden, not far from Mr. Marot's house where Mr. Defix resides. The latter decided to check what it was from the second floor of his home from where the sight was better. Meanwhile, Jean Labonne, 63, had left his home in order to closing his gate and saw the machine posed on the ground and glimpsed at a a black form within three meters of him. He shouted: "Who are you? What do you want from me?" But the intruder did not answer and regained its machine which took off immediately. At this precise time Mr. Defix, who had justopened the shutters of his bedroom of the second floor, saw the apparatus rising, like fluorescent, while a whistling sound was heard and a gush of air formed, around him, as if to grabbing him. He had time to notice under the hemispherical black cupola, three crutches which were folding up slowly. Then in a few seconds, the machine was lost in the clouds after having left a luminous trail. The next morning, Mr. Labonne went on the landing site to see if there were traces. On the fatty ground of his garden, he noted three slight prints, and astonishing thing, a great number of mushrooms of black colour and long stems, unknown in the area, which had grown on the landing site. He did not dare to touch them, and they dissolved besides like the dew in the first gleams of the sun. The sources are indcated as La Nouvelle République, of Bordeaux, for October 6, 1954; Jean Sider in Le dossier 1954 et l'imposture rationaliste, pages 178-179. *Oct. 1, 1954 - Returning home from work in Bergerac, Dordogne department, France fireman Jean Dufix, age 26, saw an oval light in the sky at 10 o'clock. He first took it to be a shooting star, but later he was alarmed when his yard looked to be ablaze. Rushing outside, he saw a disc rise from the ground with a whistling sound. It flew off, became luminous again, and then shot off at a fantastic speed. His neighbor, Jean Labonne, age 61, also saw the disc resting on three legs in the yard. They estimated the disc was three meters (10 feet) in diameter. (Sources: Le Figaro, October 6, 1954; Jacques Vallee, Passport to Magonia: A Century of Landings , p. 214, case 176). *Oct. 2, 1954 - At 10:00 p.m. in Bergerac, Dordogne department, France a luminous mushroom-shaped object was seen in the garden by J. Labonne, who described it as "constructed of plexiglass." Three meters away moved a short shadowy figure that "slid over to the machine." The object rose into the sky, leaving behind a luminous trail. There were three imprints found in the ground and some black mushrooms. (Source: David F. Webb & Ted Bloecher, HUMCAT: Catalogue of Humanoid Reports, case # A0268). Aimé Michel gives the erroneous date of October 3, is mistaken on the orthography for the witness Mr. Defiz whom he names Defix. Jacques Vallée is mistaken on the orthography in the name in the witness whom he names Dufix, and it makes a fireman of him. The errors on the name come from the national press. Just as Barthel and Brucker, all except Jean Sider seem to hav missed the complexity of the case by referring only one to the other and to briefs erroneous and incomplete summaries in the Parisian newspapers. It seemed obvious to me that Barthel and Brucker could indeed not have talked by phone with the witness Mr. Jean Defiz, as suggested by Jean Sider, since they have renamed him Jean Dufix. [---] Article in the regional newspaper Sud-Ouest, France, October 6, 1954. 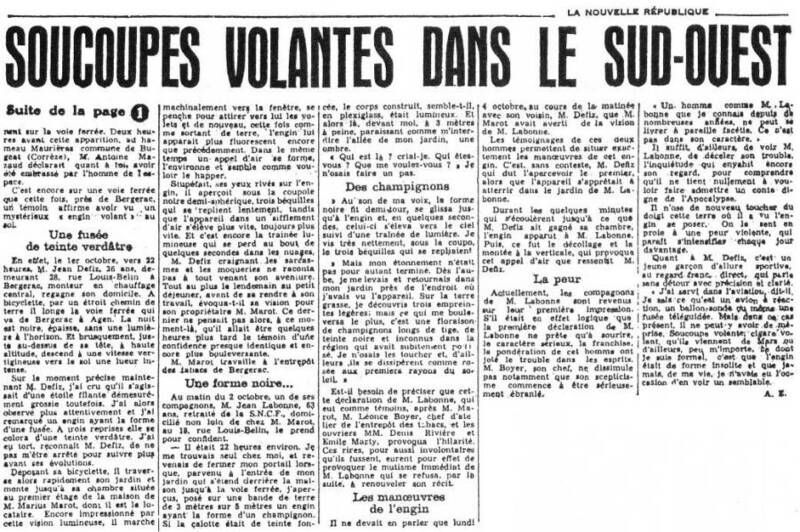 [nr1] Article in the regional newspaper La Nouvelle République, Bordeaux, pages 1, 3, 4, October 6, 1954. [---] Article in the national newspaper Le Figaro, October 6, 1954. [---] Article in the national newspaper France-Soir, October 7, 1954. [---] Article in the national newspaper France-Soir, October 8, 1954. 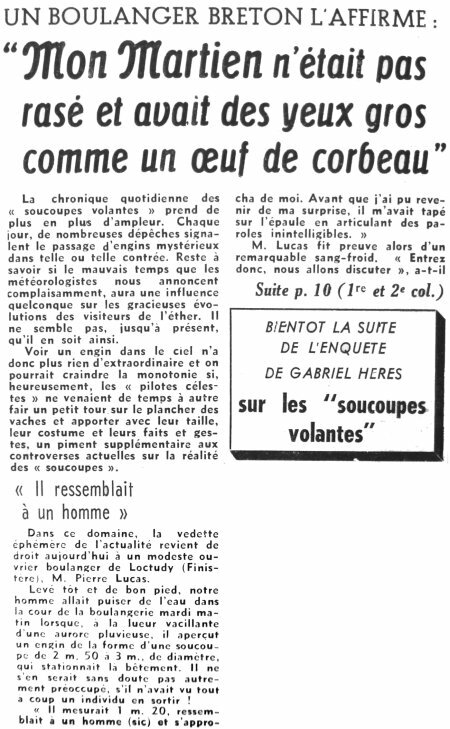 [nr2] Article in the regional newspaper La Nouvelle République, Bordeaux, October 11, 1954. 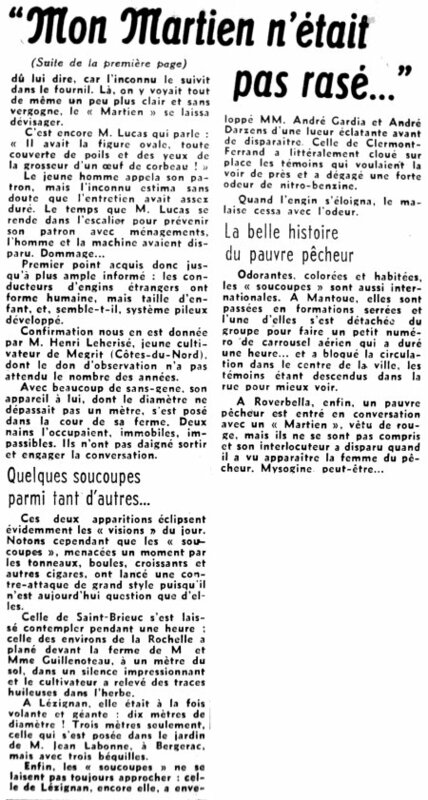 [pm1] Article in the regional newspaper Perigord Moun Pais, October 12, 1954. [ss1] Article in the national weekly newspaper Samedi-Soir, October 14, 1954. [---] "Flying Saucers in Europe", article by Aimé Michel, in Fate magazine, USA, Volume 10, No.12, Issue #93. Mary Fuller publisher, page 37, December 1957. [---] "The Humanoids", book by Charles Bowen, Neville Spearman publishers, U-K., page 34, 1969. [jv1] "Chronique des Apparitions Extra-Terrestres", French translation of "Passport to Magonia", book by Jacques Vallée, Denoel publisher, France, page 264, 1972. [jg1] "Black-Out Sur Les Soucoupes Volantes", book by Jimmy Guieu, Omnium Littéraire publisher, France, pp 196-197, 1972. [am1] "A Propos des Soucoupes Volantes", book by Aimé Michel, reprint of "Mystérieux Objets Célestes", Planète publisher, France, page 174, 1972. [gl1] "Face aux Extra-Terrestres", livre par Charles Garreau et Raymond Lavier, Delarge éditeur, J'ai Lu, France, page 75, 1975. [jv3] "1954, 7 jours, 40 observations", article par Jacques Vallée dans le magazine d'histoire Historia, France, numéro spécial 46: "Les soucoupes volantes", page 42, 1976. [am1] "Mystérieux Objets Célestes", book by Aimé Michel, Seghers publisher, France, pages 178, 179, 1977. [bb1] "La Grande Peur Martienne", book by Gérard Barthel et Jacques Brucker, Nouvelles Editions Rationalistes publishers, France, page 121,123 1979. [fr1] "OVNI, Premier Dossier Complet Des Rencontres Rapprochées En France", book by Michel Figuet and Jean Louis Ruchon, Alain Lefeuvre publisher, France, pp 113-114, 1979. [lg2] "The Fifth Horseman of the Apocalypse - UFOs: A History - 1954 October", monography by Loren E. Gross, USA, page 10, 1991. [js1] "Le Dossier 1954 et l'Imposture Rationaliste", book by Jean Sider, Ramuel publisher, France, page 19, pp 178-179, page 242, 1997. [js2] "Le Dossier 1954 et l'Imposture Rationaliste", book by Jean Sider, Ramuel publisher, France, pp 178-179, 1997. [jh1] "Firefighters and UFOs", article by Jim Hickman, 2000. [jg1] "RR3 - Le Dossier des Rencontres du Troisième Type en France", book by Julien Gonzalez, Le Temps Présent publishers, France, page 104, 2014. 1.0 Patrick Gross February 12, 2009 Conversion from HTML to XHTML Strict. First formal version. Additions [go1], [kb1], [jb1], [lc1], [ud1]. 1.3 Patrick Gross May 31, 2010 Addition [le1]. 1.4 Patrick Gross June 20, 2010 Addition [jv5]. 1.4 Patrick Gross October 1, 2014 Additions [ni1]. 1.5 Patrick Gross October 6, 2016 Addition [js2]. 1.6 Patrick Gross October 29, 2016 Additions [er1], [ub1]. 1.7 Patrick Gross December 13, 2016 Addition [lg1], [lg2], [jg1].